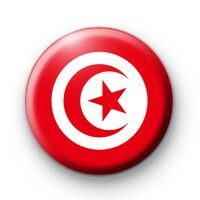 Patriotic National Flag of Tunisia Badge. This 25mm pin badge is a red and white with a central white disk incorporating a red star and red crescent flag of Tunisia, adopted as the national flag in 1959. Our World Flag badges are great for sporting events, schools and football.